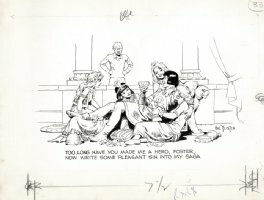 FOSTER, HAL - Prince Valiant Sunday 6-17 1945, title panel. Donardo, the robber king of Saramand, gloats to Val that he will make Aleta part of his harem! FOSTER, HAL - Prince Valiant Sunday 6-2-1968. Detail of incredible last panel with Val and his whole family! FOSTER, HAL - Prince Valiant Sunday 6-2-1968. Queen Aleta armors up for dangerous warfare-politics! great last panel with Prince Val & his whole family!